For the best experience, using controllers is strongly recommended. This is a local co-op game for 2-4 players. 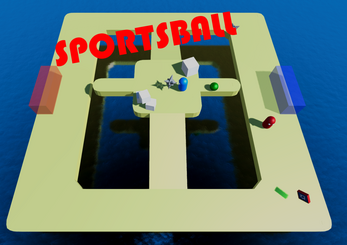 Sports Ball is a fast pased competitive game. The aim is to have highest score before the timer runs out. To gain points, just pick up the green balls and throw them into the zone matching your colour. If you fall out of the map, you will lose one point and respawn. Powerups will spawn around the map, use these for super speed, super jump or super strength! Thanks to the extension to the deadline a second game mode is available. The aim is to paint more tiles your colour than your opponent! But deaths still cost you a point, so be careful. Use this to get around quickly, or knock out other players! Pick up objects and throw them at other players to knock them out! Or throw score balls into your zone. Pro-tip: If a player is knocked out, you can even pick up them! For players 3 and 4, press jump on the controller before starting the game. This gameplay footage was from a late beta build of the game, watch the main trailer to spot the changes from this version! To play just download and unzip the zip and run the .exe.